Nadam is just around the corner. Boys under 13 years old are allowed to race horses, so I have seen young boys practicing these last few days. Hello again. I woke up to the news that DOMA was determined unconstitutional and now gay marriage can be acknowledged in any state! So, soon enough gay couples can marry and have the same rights as heterosexual couples! What a great way to start the day. Today has been beautiful. The clouds are so big and fluffy. The temperature is also perfect. I went on a long walk and took some shots. Here’s my best one. During the afternoon, Heath and I put together a shower. His family sent him the supplies. The shower felt marvelous. Let’s see, in my last post I ended with our taxi ride to UB. We got into UB in the middle of the night and some PCVs snuck us into a hostel so that we could get some sleep. Heath woke me up and told me we were meeting my future co-counselors. We walked to The State Department Store and met with 2 PCVs named Devon and Joe. 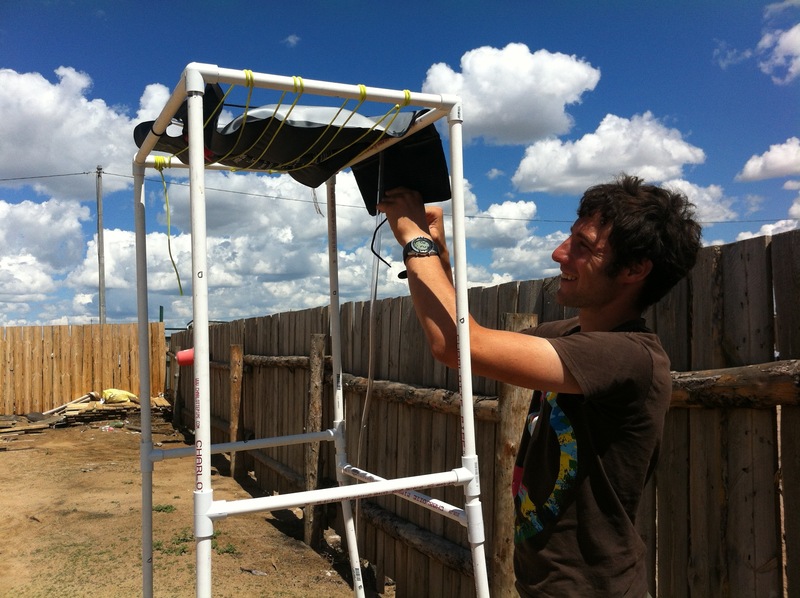 Devon is stationed in Western Mongolia and Joe is stationed in the Gobi. We said our hellos and then went straight to the bus station, so that we could get bus tickets to Baruun-Urt, the aimag (captial) of Sukhbataar province. We got our tickets and had the rest of the day to do our thing in UB. So, we split up with Devon and Joe and got some pancakes at Nayra’s Cafe. I was pleasantly surprised with their coffee and food, it really did feel like I was in a Western restaurant. 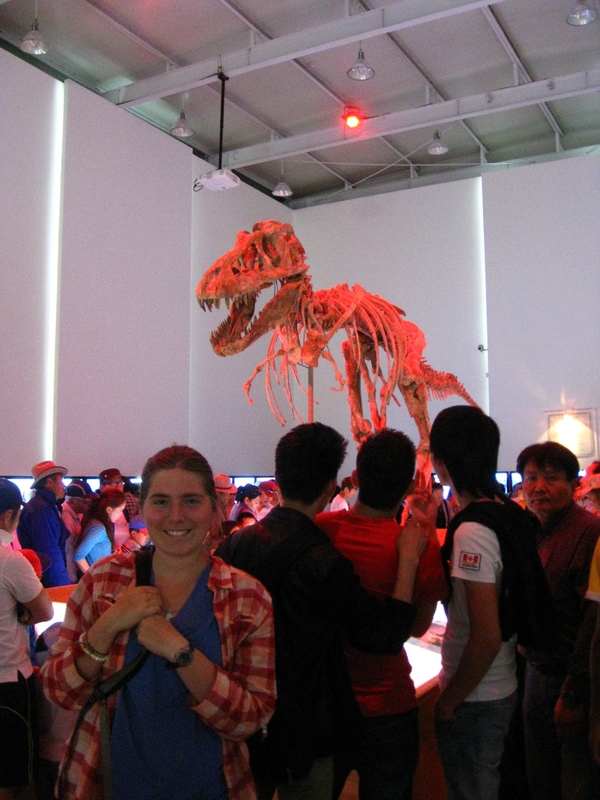 After eating, Heath and I went to Sukhbataar Square to see the free t-rex exhibit. This t-rex skeleton was smuggled illegally to the USA about 10 years ago and was only recently returned to Mongolia. It was my first time seeing a very complete dinosaur skeleton (75% complete). How cool! Heath and I packed up our things, met up with Devon and Joe, and caught our over night bus to Baruun-Urt (13 hours). The ride itself wasn’t that bad. About 40% of the road is paved, so it got a bit bumpy here and there, but overall the ride was smooth since we were on the Mongolian Steppe. Luckily, the bus was also comfortable and I had Heath as my shoulder rest. I learned on the bus that mornings start very early here, the sun rose at 4:40am. I woke up to the sunrise and man was it epic! We landed in BU at 5am and passed out in a PCVs apartment. I met 2 more counselors, and their names were Mizelle and Nick. I had finally met all the Americans I would work with. We all relaxed in preparation for camp because we knew we would be surrounded by children for the next 10 days. The next morning, we met up with our camp teachers and the 120 children that would be joining us to Dariganga’s Dream Camp. The counselors jumped into a meaker and followed the 10 other meakers full of children. The ride there was fantastic. Even though the roads were pretty bumpy, the scenery made up for it. I enjoyed looking out the window and occasionally listening to the Mongolian/English conversations. There was also a boy who kept looking back at me and giving me a huge grin. I would return his grin with an even bigger one. What a peaceful ride. After 5 hours, we made it to Dariganga and to the camp. I was very impressed with the camp layout, there was lots of grass and the holy mountain can be seen from any angle. Horses and cows graze in the distance, and there is a lake that has swans. 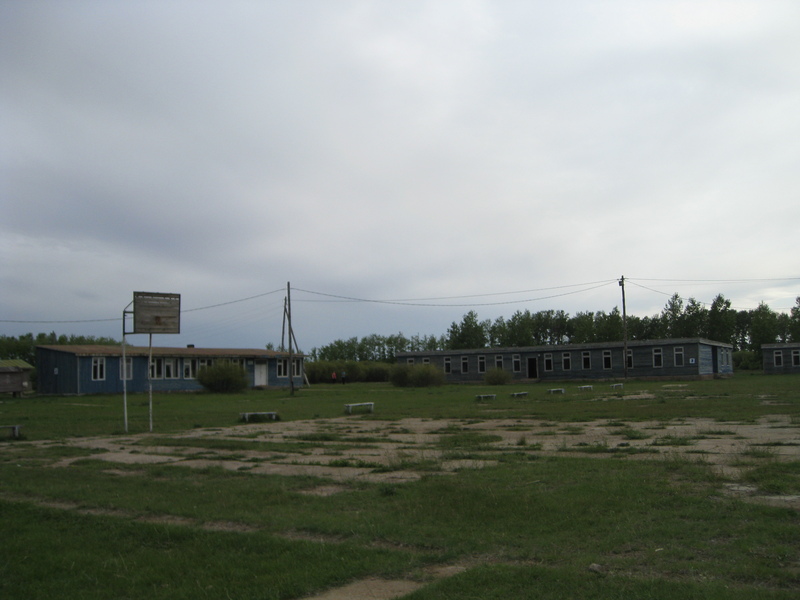 The camp itself was very rundown, but it had character that made up for the bat infested rooms, broken windows, and leaky ceilings. There was one night where 3 bats were flying around in our bedroom and I tried catching them with my laundry bag. I failed in this endeavor, but luckily an accountant (also professional bat catcher) caught 2 bats with elongated tongs and released them outside. But, enough about the negatives, how about some positives? So pretty right? 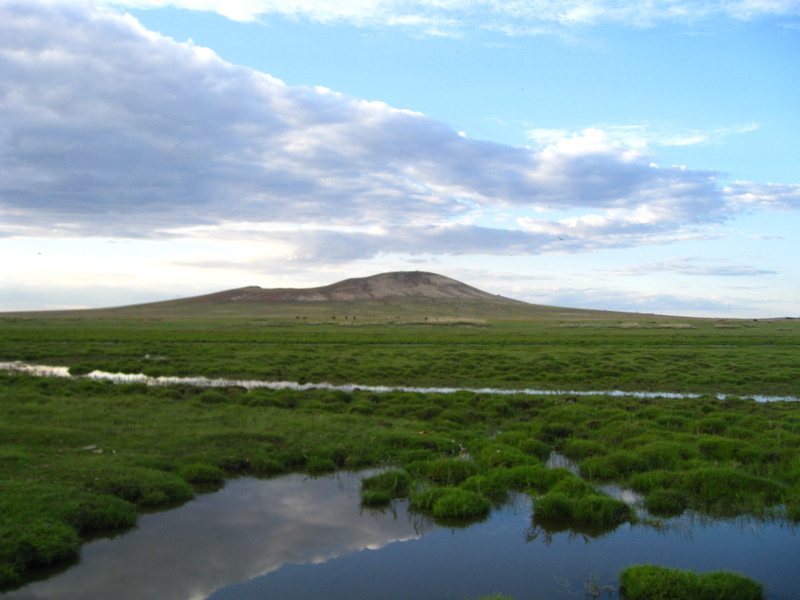 This is the holy mountain, Altan Ovoo. Those are horses grazing in the distance. Well, the children were frickin’ adorable. Dream camp is an English camp, so these kids come here to practice their English. Some kids are from the city, so their English is very good, while some of the other children are from the countryside and their English is very limited. 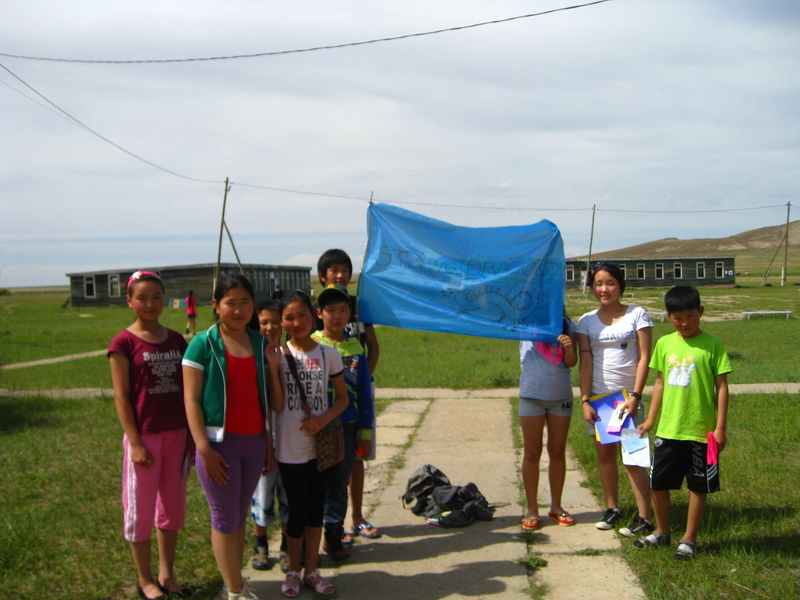 My job was to teach English to the 14 year olds with a Mongolian co-teacher. I would spend 1 hour each day with them teaching vocabulary and speaking aloud so they could listen to my accent. The rest of the day was filled with activities and free time. Often enough the children would play basketball, soccer, or hangout in their rooms. 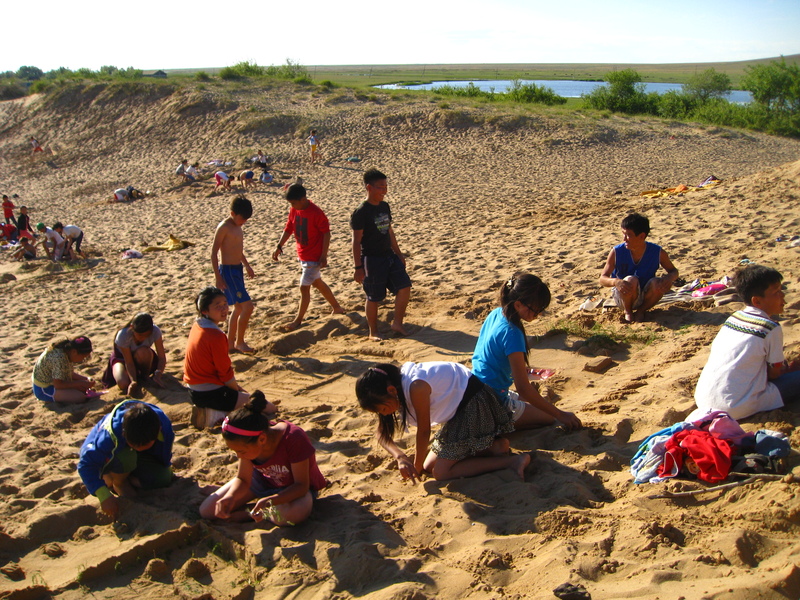 During the activity times, the counselors would lead the children in either outdoor games or singing lessons. I ran both activities on different days. During singing time, I taught Itsy Bitsy Spider, I’m a Little Tea Pot, and The Lion Sleeps Tonight. Meanwhile, I taught elbow tag, lighting (a basketball game), and helped with kickball during outdoor time. Nick (a PCV) and other kids playing Frisbee The cafeteria and a dormitory. During eating time, the counselors would split up and sit with random tables. We would speak English to the kids, so to encourage them to practice. I got very accustomed to telling them: my favorite color is green, my favorite animal is a turtle, my family has 7 people, my favorite movie is The Lion King, and I am 23 years old. I said those phrases multiple times a day for 10 days. Whew, Nelly! I could go into more detail about the camp, but that would take a long time and I think it would be best to tell you in person. There were so many little things that happened that made me very happy. 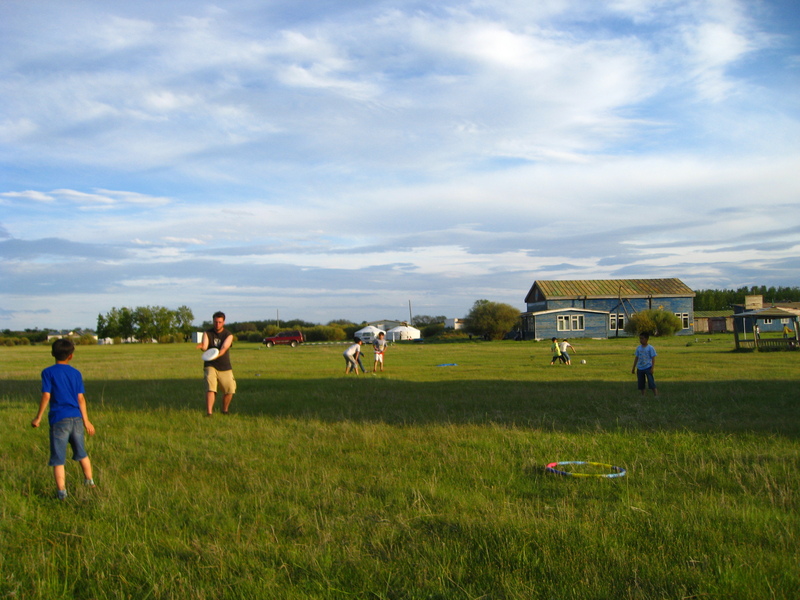 Such as simply playing Frisbee with the kids, going on walks around the camp ground during dusk, and bonding with the children. I think one of my favorite moments was an impromptu dance lesson. 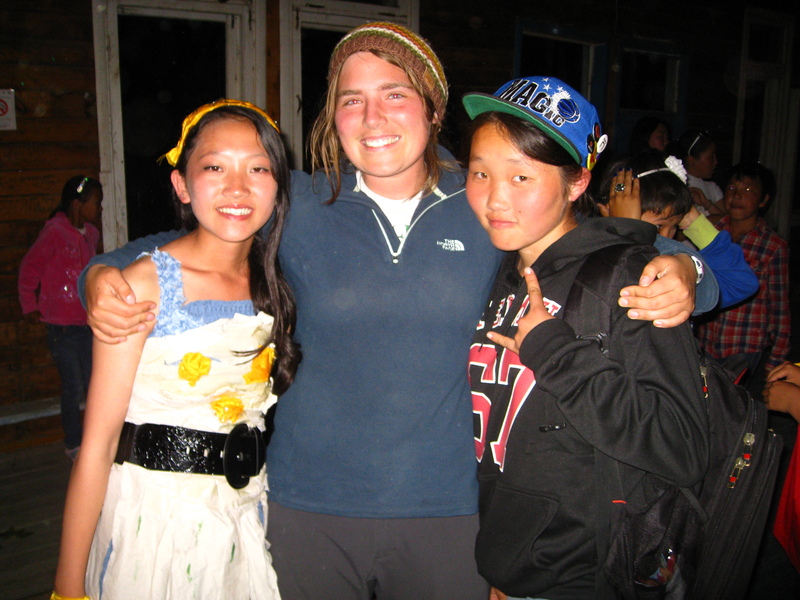 One evening, I was playing guitar with a group of girls and a fellow Mongolian counselor beckoned me to come to the camp center. I obliged and it ended up becoming a dance competition. He’s pretty good at dancing, so I knew I had no chance. So, the only way to impress the campers was to try out some of my swing dancing! I grabbed the other counselor’s hands and started leading him in good ‘ole East Coast Swing. He was perplexed and the children were bursting into laughter, seeing me twirl this dude all around. I in the end won the competition and then other children wanted to dance with me. Eventually, it turned into a big dance lesson, where kids were surrounding me and watching my footsteps. It was so cute. I even got some boys to dance with girls. Success! Well, that’s about it. I should head out. We’re deep cleaning Heath’s ger because even more people are coming next week to stay. We’re also making pasta, hooray! -Molly My team: The Strong Dragons! Travis, thanks for the hard work during your service. I’m happy that my post reminded you of some good memories. Dariganga is pretty much the same, except for the new library/city center/Coelin Tuv and a remodeled school. Oh, and I bet you’d be surprised to hear that there is wifi! It’s very inconsistent, though. The camp is definitely the same. Two buildings are inhabitable (was that the same for you?). And the lake is still super swampy. Ah, what good times.